Voters go to the polls Tues., Nov. 6, for the 2018 General Election. All voters will be casting ballots for statewide offices, a statewide constitutional question, and the local penny sales tax referendum. There will be some contested races in Saluda County, but none of them are countywide. In the Town of Saluda, Mayor Amelia Herlong is being challenged by Michelle R. Curry. The Saluda County Schools School Board race with have two contested elections, incumbent Katherine Coleman is facing Crystal Gibson for Seat 4, and Sunday Jacobs Minick is opposing incumbent James Moore for Seat 4. Lexington School District Three has five candidates, William Berry, Frances Bouknight, Cheryl Burgess, William Cogdill and Gariane Gunter, running for three seats. Statewide Constitutional Amendment: Must Section 7, Article VI of the Constitution of this State, relating to state constitutional officers, be amended so as to provide that beginning in January 2023, or upon a vacancy in the office of Superintendent of Education after the date of the ratification of the provisions of this paragraph, whichever occurs first, the Superintendent of Education must be appointed by the Governor, with the advice and consent of the Senate; to provide that the appointed Superintendent of Education shall serve at the pleasure of the Governor; and to require the General Assembly to provide by law for the duties, compensation, and qualifications for the office? These two require a “Yes” or “No” vote. Secretary of State: Melvin T. Whittenburg, Democrat; Mark Hammond, Republican. State Treasurer: Rosalyn L Glenn, Democrat; Rosalyn Glenn, Working Families; Curtis Lotis, Republican; Sarah Wok, American. The festival site is located between Batesburg-Leesville, Ridge Spring and Saluda. From Batesburg-Leesville take Hwy. 178 north toward Saluda or from Ridge Spring take Hwy. 39 north toward Saluda from Saluda take Hwy. 39 south toward Ridge Spring follow the signs and exit onto Duncan Road which leads to Richland Creek Road. The gates open at 9 a/m. each day. 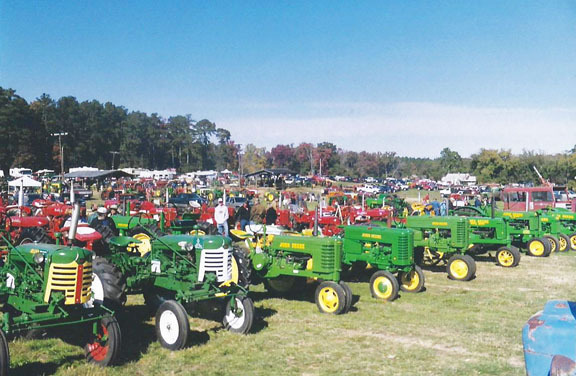 This family event has activities planned for everyone with demonstrations of old farm machinery, steam engine, saw mill, hit miss engines, syrup cooking, shingle making, thrashing of grain, blacksmith shop, a barnyard exhibit, pedal tractor race/pull and a antique tractor pull for tractors through 1960. There will be vendors and exhibitors for men, women and children, and a variety of great food, soft drinks and homemade ice cream. On Friday at 7 p.m. there is be a dun demonstration antique the tractor pull, and on Saturday competition antique tractor pull will begin at 1:00 p.m.. Admission is $5.00 a day for Friday and Sunday and $10.00 a day on Saturday for adults; children under 12 years old are admitted free. RV hookups are available by reservations at $45.00 for the weekend for water/electric only. This is an educational/family event and NO ALCOHOLIC BEVERAGES OR OTHER CONTROLLED SUBSTANCES WILL BE PERMITTED!!! 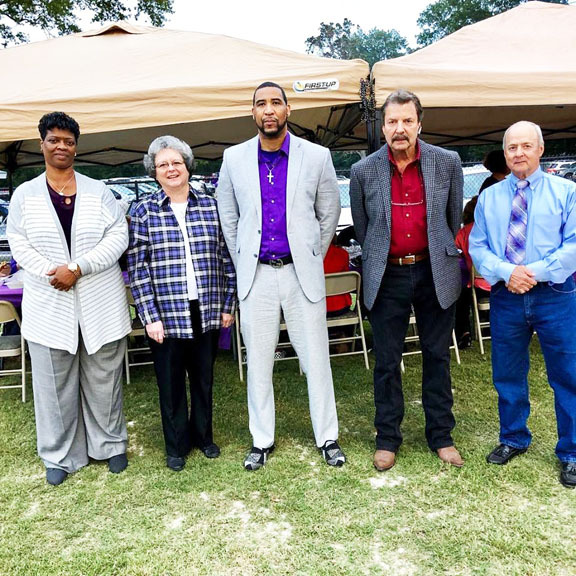 NEW HALL OF FAME CLASS - Inducted into the Saluda County School District Hall of Fame Friday were, L to R, Phyllis Deloach, Deborah Minick, Corey Daniel, and accepting for their late brother Ronald Coleman, Ben and Buddy Coleman. The Saluda County School District inducted its 2018 Hall of Fame class at the halftime of Friday’s Saluda-Abbeville game. The late Ronald Coleman - 1967 Graduate , 1966 Most Valuable in Football , 1966-67 Basketball Most Valuable Player on the Region 5-A Conference Championship Team, Averaged 20 points per game in his senior season, 1967 North South All Star Game. Corey Daniel - Football 92-93, Track All Region, All State,; Region Champion in 100 Meters, 200 Meters, Long Jump, Triple Jump; State Champion 100 Meters, Long Jump; Basketball All Region , All State, Region Player of the year, North South All Star Game; Attended Erskine College on a Basketball Scholarship. Phyllis Deloach - Lettered in Volleyball, basketball and Softball; 4 years all Conference in Basketball; 1985 High School All American; Attended Anderson College. Deborah Minick Teacher at Saluda High School 1986-2018; Taught Teacher Cadets 1997-2016; CERRA Board of Directors Executive Committee; PACE Teacher 2004-2018; SHS Teacher of the Year 2002 and 2007. Saluda County Sheriff’s Office invites you to join us for Our Annual Trunk or Treat Wednesday October 31, 2018 from 5:00pm to 7:30pm at the Saluda County Recreation Complex located on the baseball field below the Sheriff’s Office. The night will consist of a costume contest, judging the decorated trunks, games, hayride, food and at 6:30 we will line the children up and begin our Trunk or Treat walk. At that point the children will receive their candy. We would like to allow the children of Saluda County to be able to have a fun and safe time celebrating Halloween. Admission is free; however we will be collecting can goods to help stock up our local food bank. The Sheriff’s Office would like to extend our invitation out to churches. We have been able to reach some churches; however some we have not. We would like to invite you to come and share this fun filled night with us. If the referendum passes, the items listed on the ballot will benefit from the one cent on the dollar sales tax of projected revenue for the next eight years. This tax is a fair way to create revenue for much-needed county pro-jects, Property owners currently bear the bulk of tax responsibility. Over the eight years, a one-cent tax will generate almost $9 million. Increasingly, counties are using CPST revenue to supplement property taxes and state revenue shortfalls. Over the next few weeks, you will see flyers and signs about the referendum, and a public meeting will be held prior to November 6 for questions and answers. Additionally, the list must be voted in as a whole. If the referendum passes, Saluda County will have the opportunity to make positive changes! Please, support this referendum! Thank you! CONDITIONS AND RESTRICTIONS ON THE USE OF THE SALES AND USE TAX REVENUE COLLECTED UNDER THE CAPITAL PROJECTS SALES TAX ACT: The capital projects sales and use tax shall be used and expended for procurement, design, engineering, construction or improvement or similar type uses of the projects listed above. Net proceeds of the sales and use tax must be expended for the purposes stated, with some of the projects listed above expected to be funded simultaneously. The completion of the above projects funded by the sales and use tax is subject to acquisition of property and right-of-way, design and engineering considerations. Funding of projects from other sources, bids in excess of project estimates, qualifications of bidders, cost overruns, financing costs, exhaustion of net sales and use tax revenues prior to the completion of the projects stated above and other unforeseen circumstances and conditions, which, if any of these circumstances are encountered, the County Council reserves the right to make adjustments to the priority of the projects as originally submitted by the Capital Project Sales Tax Commission. INSTRUCTIONS TO VOTERS. All qualified electors desiring to vote in favor of imposing the tax for the stated purposes shall vote “YES.” All qualified electors opposed to levying the tax shall vote “NO”. Most, if not everyone, have watched or at least has heard of the television shows Antiques Roadshow and American Pickers. Although collecting has always been a hobby for some, these, as well as other similar shows, have increased the popularity of collecting and picking for individuals across the United States. Everyone either collects something or they know someone who does. Everyone has their own story behind why they collect what they do. Often collections connect people to a period or time that they feel strongly about. This is why many collect nostalgic items that remind them of and allow them to relive their childhood. 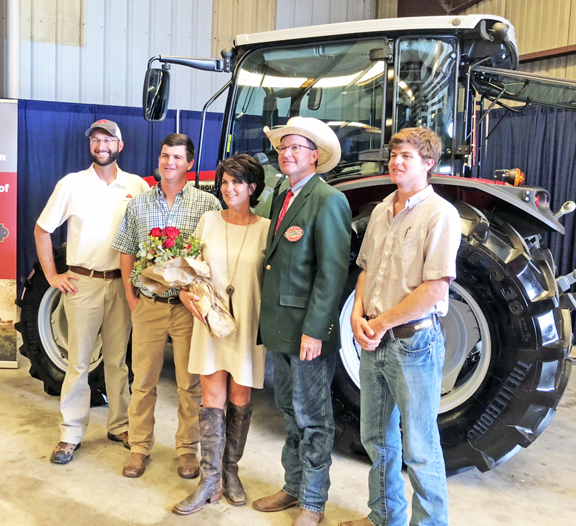 For example, at last year’s Extravaganza Expo, there was a man who purchased a farm bell because it reminded him of the special times that he spent at his grandparents when he was growing up. There was also a woman who was at the Expo who was looking for a Tip Cola bottle because she remembered enjoying these drinks back in the 1940s, and this bottle she was searching for had to have “Edgefield, SC” on it because that was her home town. Others collect items that indicate a specific interest. Vintage duck decoys were among some of the favorite Expo purchases last year of a young couple who were decorating their first home with hunting décor. 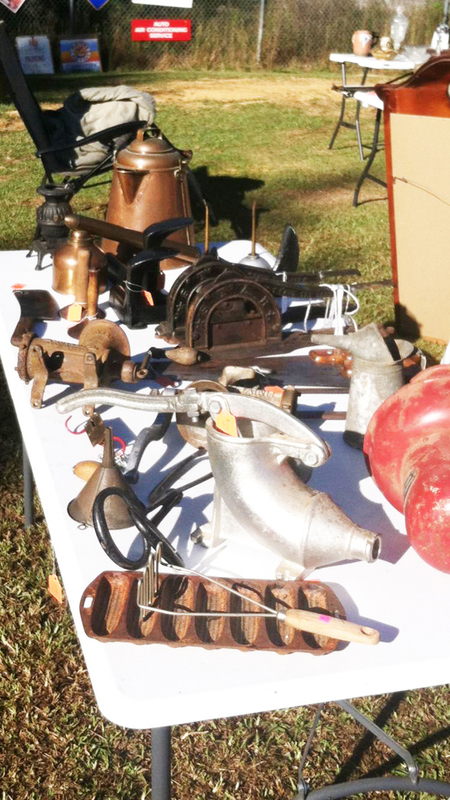 You name it; someone collects it: old toys, cast iron, antique and vintage furniture, vintage tools, head vases, old bottles, pottery, primitives, vintage bicycles, gas and oil memorabilia, advertising signs, and the list goes on. Often collecting is a quest, a lifelong pursuit of these types of items the collector is passionate about. Not only do collectors enjoy the hunt for their passion, they also relish good conversation with life-long collectors as well as those just thinking about starting a collection. These conversations include talk about what they collect or want to collect, the best places to go to hunt for additions to their collections, their most prized piece in their collection, and even the one that got away. It doesn’t matter what you are passionate about, what your collections consist of, or if you just want to find something special for your home or man cave, you are sure to have good conversation with other lookers, shoppers, collectors, and vendors both local and even states away, while experiencing the thrill of the hunt at the 2nd annual Extravaganza Expo at Saluda Pickers. This year’s Expo will take place October 19–20 at 605 Johnston Hwy, Saluda.